Conservative Gary Sambrook, with his proud mum Margaret, celebrates with his campaign team after winning Kingstanding by-election. He is elected to Birmingham City Council at the fifth attempt. Tory Gary Sambrook became a councillor for Kingstanding at the fifth time of asking in a shock by-election victory last night. The Conservatives won the Birmingham City Council seat for the first time since the late 1960s, leaving Labour supporters looking shellshocked during the late night count at Twickenham Primary School. 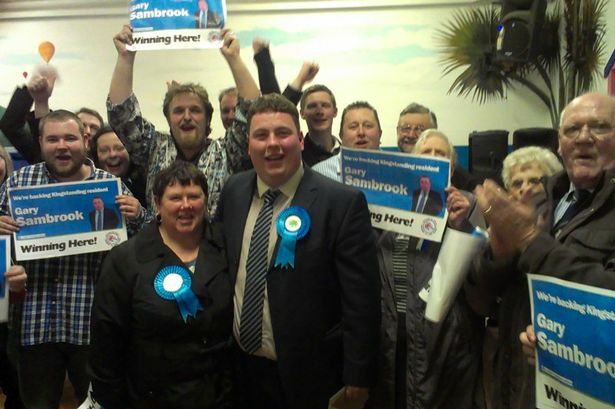 A Labour majority of 405 two years ago became a 138 vote Tory majority for the newly elected councillor Sambrook. He put the victory down to grass roots campaigning and perseverance, having lost four previous local elections in the ward since 2008. But there were recriminations from defeated Labour candidate Lorraine Owen who attacked the Tories negative campaign and branding of her as a candidate ‘parachuted’ in from outside the area. A delighted Mr Sambrook said: “This victory has been a long time coming, I’ve been campaigning in Kingstanding for eight years solid. This was a result of grass roots campaigning - lots of down your street stuff. He said that his win showed Tories can do well in white working class areas with some hard work. “There is no excuse,” he added. It is not yet clear whether his campaign song ‘Vote Gary’, penned by duo Ben and Mike, had any impact. Disappointed Labour supporters claimed it is a freak by-election result which had lost the previously solid seat and that in the May local elections they would be back. But there will also be an inquest into their campaign tactics with some claiming they responded too late to the Conservative’s labelling of candidate Lorraine Owen as an outsider. UKIP, which is hoping to make a breakthrough in big cities like Birmingham finished a distant third with 233 votes. It was also a disappointing 19 per cent turnout, meaning that despite seeing a major campaign push from all sides and a deluge of leaflets dropped through letterboxes, less than one in five people braved the winter voted. The by-election was called following the sudden resignation of former Labour councillor Cath Grundy in January. Mr Sambrook is councillor until May 2016. Labour still retains over all control of Birmingham City Council with 76 seats compared to 29 for the Conservatives. The result: Gary Sambrook (Cons) 1,571, Lorraine Owen (Lab) 1,433, Roger Tempest (UKIP) 233, Graham Lippiatt (Lib Dem) 43, Terry Williams (National Front) 33. Majority 138 votes. Turnout 19 per cent.